The Tanto Blur offers all the great grip advantages of the other Blurs on the force, but this one offers tactical styling with a plain edge modified tanto blade. 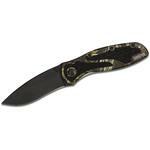 With its angled shape, the tanto blade provides additional piercing power to penetrate tough materials. The unique shape puts more steel behind the point to support its piercing tasks. 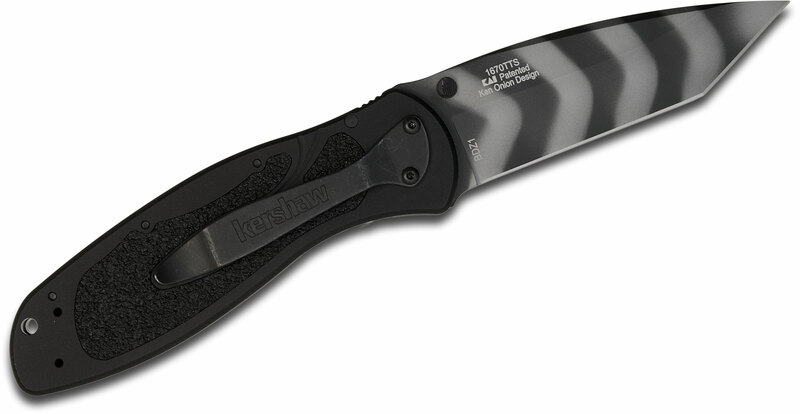 Kershaw also found that the short front edge is particularly handy for opening boxes. 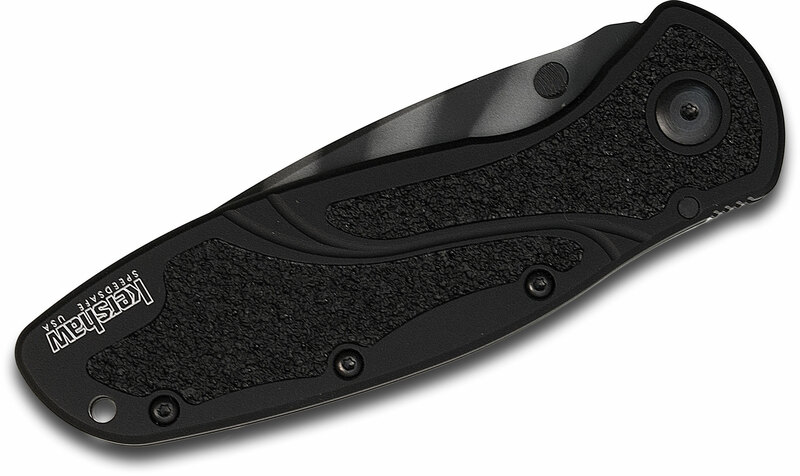 For razor sharpness, Kershaw hollow grinds the edge. All this makes the Tanto Blur a good choice for situations in which you're going to need to make an impact on your environment. In an emergency, could be a real lifesaver. The Tanto Blur's blade is built of Carpenter BDZ1 high-performance stainless steel for superior edge retention and excellent strain resistance. SpeedSafe- Assists you to open any SpeedSafe knife quickly and easily with a manual push on the thumb stud or pull back on the flipper; built into many Kershaw best sellers. Reversible- Pre-drilled holes in the handle enable the user to change either the tip position or the side on which the knife carries. Insert Liner Lock- A strip of stainless steel is riveted inside the knife's handle-most commonly when the handle is a lightweight material. This enables us to create a slimmer, lighter knife, while still providing the strength and security of a locking liner. 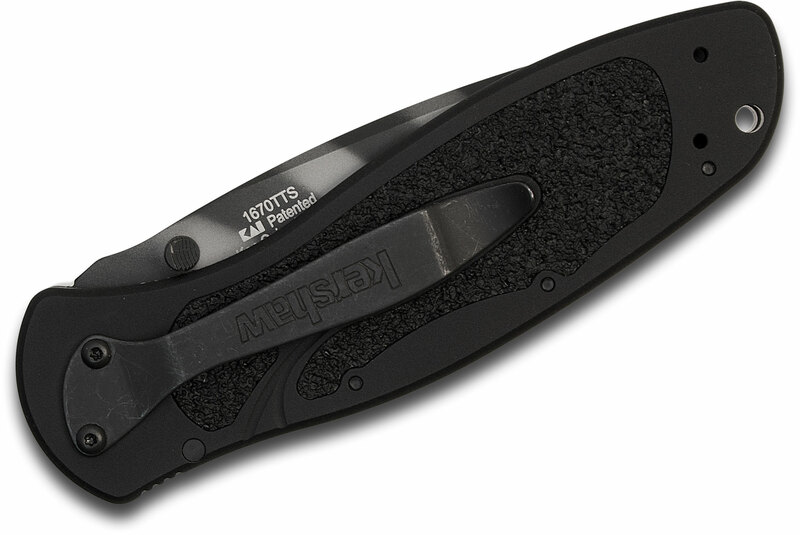 Made in the USA- When you see this on one of Kershaw's knives, it means the knife was made in their Tualatin, Oregon manufacturing facility by skilled Kershaw knifemakers. This is a great looking solid functional knife. The Tiger Stripe on the blade looks great. Razor sharp blade. Very easy to open with assisted thunk stud. Fast shipping from the Knife Center. Feels like a much more expensive knife..
Bought this knife as a general all-around carry blade. It has not disappointed me! Razor sharp and easy to use, I carry it at all times. A great buy. 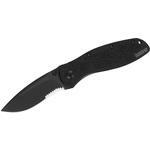 Hey, I wanted to share "Kershaw 1670TTS Ken Onion Blur Assisted Folding Knife 3.4 inch BDZ1 Tiger Stripe Plain Tanto Blade, Black Aluminum Handles" with you from KnifeCenter.